Nestled between Corolla and Southern Shores is the quaint village of Duck. One of the most popular resort destinations on the Outer Banks, Duck was praised by the Travel Channel for its “relative solitude and its vast array of neatly constructed rental homes [which] make it ideal for families.” The area is almost entirely residential, with numerous Outer Banks vacation homes and a charming village at the center. Duck is known for its quiet and charming appeal as well as its walkability. The town is one of the most dog-friendly on the Outer Banks and is a great choice for visitors looking for a pet-friendly Outer Banks vacation rental. The town park and boardwalk feature 11 acres of soundside maritime forest and willow swamp. 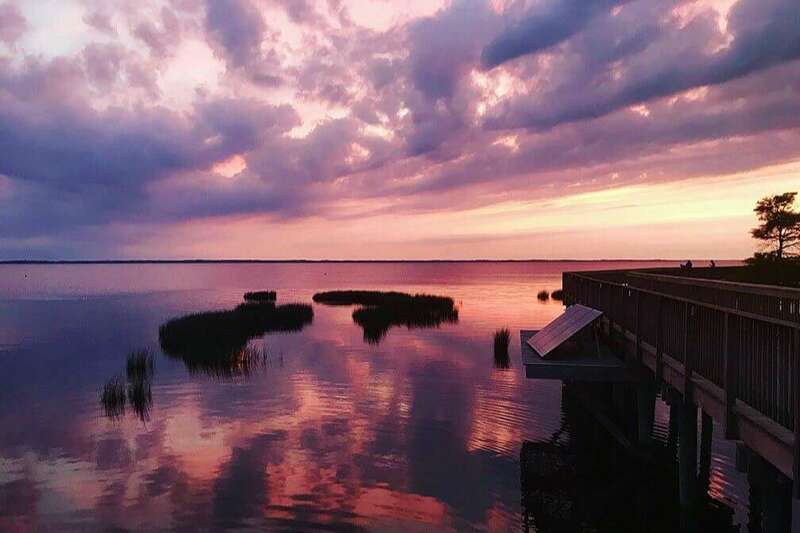 The boardwalk is nearly a mile long and offers some of the best sunset views on the Outer Banks. Dogs are welcome on the boardwalk so long as they are on a leash. There is also a public sound access including a boat and kayak launch. The town park hosts a number of events throughout the year. The Duck Jazz Festival is hosted annually in the fall and draws jazz performers and lovers from across the country. On the Fourth of July, the town holds an annual Independence Day parade, which runs through the center of town and is a fun experience for the whole family. 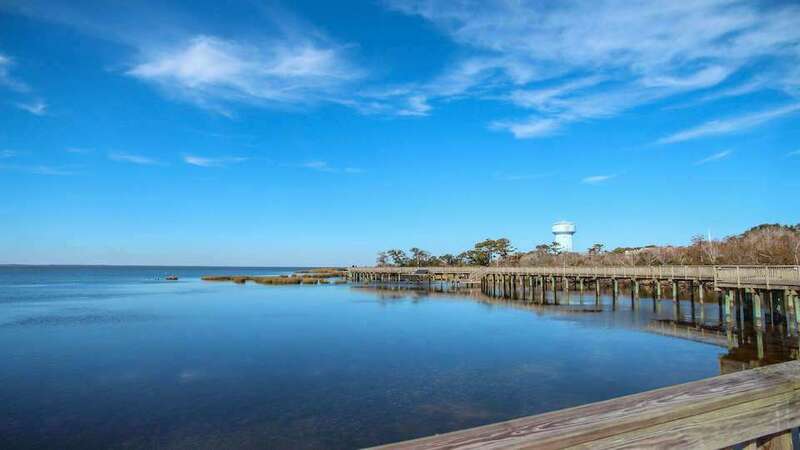 One of Duck’s best features is the Currituck Sound. The sound is an awesome place to go kayaking, stand up paddle boarding (SUP), or any number of other water activities. Don’t worry about hauling your equipment down with you, Duck has several rental shops that offer everything from bikes to paddle boards. Walking the town boardwalk is a perfect way to enjoy the beauty of the sound. Or, if you’re looking to enjoy more of the sound, consider staying in a soundfront vacation home. One of the key elements to making Duck so walkable is its multi-purpose trail. This six mile long paved path runs the entire length of the town. Bicyclists, pedestrians, skaters, and dogs on leashes are welcome to use the path. The trail is a perfect way to explore Duck or just enjoy a morning run before your day at the beach. At the heart of Duck is the village. The main commercial area in the town, this cluster of shops and restaurants is just a short walk from many of our Duck vacation homes. The village features a multitude of shops to explore from on-trend clothing boutiques and home goods stores to inviting bookshops and unique art galleries. Shopping complexes such as Scarborough Faire and Scarborough Lane house an assortment of locally owned shops and eateries. Duck also offers an assortment of dining options. The roadside dives around town are perfect for lunch or laid back dinner and often feature live music throughout the summer. For a more upscale dining experience, Duck has fine dining options offering intimate atmospheres and waterfront views perfect for a date night. a. Duck is one of the most dog-friendly Outer Banks towns thanks to its lax beach laws. Duck is the only town to allow dogs to play on the beach without a leash, so long as they are under their owner’s watchful eye. Just remember to always pick up after your pet! Duck temperatures average around 80 degrees from June through September with shoulder seasons (fall and spring) hovering in the 60s. Duck has a mild winter with temperatures averaging in the 40s. Located at the northernmost point of Duck, Sanderling offers privacy and solitude to guests in this ocean to sound community. The community offers a soundside pool, basketball hoop, boat launch, tennis (with a fee), and many nature trails. Gull’s Flight, Sound Sea Village, Sea Tern, and Caffey’s Inlet Hamlet, are all quiet, secluded neighborhoods at the northern end of Duck. Still just a short bike ride into town for shopping or activities. The ocean to sound community of Northpoint features an indoor heated community pool, tennis courts, oceanfront gazebo, and soundfront pier for fishing, crabbing, or kayak launching. Just 3 miles north of Duck Village, Port Trinite offers enough community amenities to keep everyone busy. In addition to the beautiful beach, this community also offers a soundfront beach, two swimming pools, and tennis courts. All located on high natural dunes, the homes in these neighborhoods are within walking distance of both the ocean and the sound. Wonderful water and sunset views and easy beach access make the communities of Carolina Dunes, and Snow Geese popular vacation choices. Enjoy wonderful sound views from the townhomes in this community. In addition to a soundfront community pool, these units also have access to tennis courts, and are within walking distance to one of the largest watersports facilities in Duck. Every home in Sea Ridge and Osprey has a view, and whether it is of the Currituck Sound or the Atlantic Ocean, you won’t be disappointed. Most homes in these communities have access to a community outdoor pool in Osprey (check individual property description for details). Sound access is directly across the street. Parking is limited to loading and unloading. Guests may launch small non-motorized boats and sailboats at no charge. Located on the northern edge of Duck Village, Sandy Ridge borders the open lands of the Army Corps Research Pier and offers ocean and sound views. Ride your bike or take a stroll into Duck Village from the homes in the Oceanside community of Olde Duck Beach. There’s something for everyone at these beautifully appointed one and two bedroom semi-oceanfront condominiums with access to extensive community amenities including on-site laundry facility. Homes on Sea Colony Drive also share the following community amenities: Oceanfront pool, tennis courts, full length basketball court, playground, horseshoe pits, volleyball court, oceanside parking, pool side showers & restrooms, and grilling & picnic areas. The Oceanside communities of Bayberry Bluffs, Saltaire, and Poteskeet Village are located in the heart of Duck Village, and are an easy walk or bike ride to many shops, restaurants, and watersports facilities. Enjoy ultimate relaxation at this Oceanside community located in the heart of Duck. On sunny days bask in the sun at one of the two outdoor pools or take the fun indoors at the recreation center that provides an indoor pool, whirlpool, tennis and racquet ball courts, exercise equipment, TV room, pool table, wireless internet, and gameroom. Located in the heart of Duck Village, Duck Landing is an exceptional Oceanside community within walking distance to many shops and restaurants. All homes in Duck Landing have access to the following community amenities: Indoor swimming pool and kiddie pool, tennis courts, playground, clubhouse with fitness facility & game room, and private beach access with parking. Tucked away behind Loblolly Pines shopping center, Poteskeet is a very quiet, secluded spot with very convenient access to Duck Village activities. Park your car for the week and enjoy the peace and serenity of this quiet and private Oceanside community. Easy access to Duck Village shops and restaurants for a quick lunch or after a day at the beach. Situated right at the beginning of Duck Village, the homes in Sea Pines all offer access to a community pool and tennis court. This neighborhood is one of the most convenient to shops and restaurants in the village. Every season is the perfect season to vacation at Four Seasons. This premier ocean to sound community is the right combination for relaxation and fun. Play in the indoor and outdoor pools. Visit the clubhouse with fitness facility, don’t forget about the tennis and volleyball courts and the playground for the kids. And enjoy evening walks down the lighted sidewalks. Just south of Duck Village you’ll find these wonderful neighborhoods, all with easy access to Duck Village via the Duck Trail. Tuckahoe is an ocean to sound community that offers guest access to a community pool, tennis courts, and soundside pier with parking area. The Tides is a small Oceanside neighborhood south of Duck Village. Bias Shores is an ocean to sound community that offers guest access to a community pool, tennis courts, and soundside pier. Ocean Crest is an ocean to sound community that offers guest access to a community pool, tennis courts, and oceanside parking. Some of the soundside homes in this neighborhood have access to the Ocean Crest community amenities (check individual property description for details). Enchanting sunsets await you in this beautiful soundside condominium complex in Duck. Only a short distance to the beach, Nantucket amenities highlight this complex: indoor community pool, outdoor tennis court, soundfront gazebo and beach, small boat dock.